Shares in the world's largest security group, G4S, dropped nearly 5% after it downgraded its revenue growth forecast. The company now expects revenue growth of 3-4% this year, compared with an earlier forecast of 4-6%, following a disappointing performance in the Middle East and India. G4S was the biggest faller in the FTSE 100, with the index closing down 49.17 points at 7,513.11. Primark owner AB Foods fell more than 3.7% despite posting a rise in profits. The food-to-fashion group said adjusted operating profit rose 22% to £1.36bn in the year to 16 September, with group revenues up 15% at £15.4bn. However, AB Foods shares were hit after it said that profits at its sugar business were set to fall this year as a result of lower European Union prices. Outside the FTSE 100, shares in upmarket drinks maker Fevertree jumped nearly 15% after it said its full-year results were set to be "materially ahead" of current market expectations. 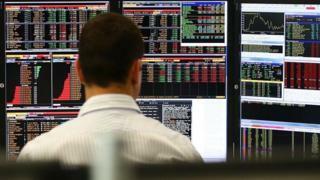 It said UK trading had been "particularly impressive". On the currency markets, the pound fell 0.2% against the dollar to $1.3146 but it edged up 0.09% against the euro to €1.1356. Oil prices edged lower after having surged in the previous session. On Monday, prices had risen by the most for six weeks after Saudi Arabia's crown prince moved to tighten his grip on power at the weekend. Saudi Arabia is the world's biggest exporter of crude oil and the second-largest producer of the commodity. Brent crude slipped back below the $64-a-barrel mark to $63.81 on Tuesday, while US crude dropped 0.4% to $57.15 a barrel.